But that is precisely the problem- you have been told by several people now that the terms are not seen that way in a COJCLDS context. I know you have a problem with LDS "exclusivity" as you put it but you need to understand that it is real. Every thread you start is a variation of the same point. Do LDS really think they are the only true AND living church? LIVING because we have prophets and change is a vital part of the church. Some members do not understand that because they have been raised in tradition, but if you actually read and understand the scriptures and what has been said about them, you see it otherwise. I am always butting heads with "traditional" Saints because I came in as a convert without traditions, so I go by what is actually written content. They see prophets as infallible- I see them as I see Joseph- as a fallible human being who God chose despite the limitations of all humans, to deliver us the gospel. The traditional view is made of ...just that- traditions which do not necessarily reflect the gospel as shown today. But if you actually read what Joseph Smith said about it- he did not see it that way. I was talking to my stake president who agrees completely with me that this church is not about tradition but about BECOMING the best church and best human beings we can be. Classic Secular Christianity cannot be changed- by definition but ours is a church based in BECOMING and individual and church wide PROGRESSION. The recurring changes in the Temple ceremonies are simply examples of that. The recent ones have clarified positions and misunderstandings about the marriage relationship. But they bother many traditionalists. What you do not understand is that it is not about "correcting doctrine"- in many instances it is about CREATING Doctrine! Traditional Christians would call that "adding to scripture" and as something never done- while it is the ESSENCE of our church as a living church. Mormon Doctrine- the McConkie book for example- fossilized that traditional view into stone where he said ridiculous thinks like that it is against doctrine to play cards with "face cards". Totally wrong. Perhaps it was a Protestant fundamentalist tradition which got carried into the church- as many of these points you bring up are. But that one has no basis in fact. But many of those traditions do not have any basis in the gospel of Jesus Christ as proclaimed by the COJCLDS today. I know you won't respond- but this is for others anyway. Ten times in this response I read the word "you." I will try and respond with "I" messages. They are much less toxic and don't come across as mocking and personal. I am part of a very traditional Christian community. And yes, I don't play with face cards, nor does any one else in my family. It is one of those non-essential doctrines I often talk about. I don't feel very good when my word of wisdom is mocked, but i understand that not playing cards is more a cultural thing than a Biblical thing, just as are some traditional LDS doctrinal beliefs. I didn't start this thread to argue or debate. I have already said that elsewhere. I simply wanted to use terms that accurately reflect LDS beliefs, since often a cornerstone of LDS apologetics (using now as a term I own) is that non-members do not understand LDS terms and doctrines. Therefore I continue to seek to understand and will continue to do so as long as I am able. If I wasn't sincere I would grab a Tanner or a Walter Martin book and simply regurgitate what I read. That would be neither honest, accurate, or pleasing to God. My conclusions about the doctrines of the Church of Jesus Christ of Latter-day Saints are mine and mine alone. They come from reading 19th, 20th, and 21st century books by faithful Mormons and from more than a year's active participation in a Mormon ward. I have never, to my recollection read, nor desired to read one book, article, or video by an anti-Mormon. I have no time for that. My conclusions are by a huge majority very positive. I do see blind spots; they are not criticisms. I offer them to help. I want to know and recognize my blind spots. I have no other purpose. I did, one day however, unknowingly sit beside Sandra Tanner at a Mormon history conference! I have intense needs to know and understand. I keep digging and asking until I think I have it right. I fail to see how or why it is anathema to ask about the use and understanding of the terms polemics and apologetics? I have in fact heard both used in the LDS conferences I have attended. I seek to understand more. I own the fact that I believe from twenty-eight years of studying LDS history that the Church's doctrine and history are inextricably linked, just as they are for many other groups like the Mennonites with a shared history that promotes group consensus, cohesion, and yes, traditions in strong ways. My understanding is that any church's doctrine is sifted through human and group filters prior to becoming dogma. That is inevitable. I own that belief. I acknowledge that the sting of hearing LDS "onlyisms" is something that I acutely feel, so yes, I bring it up a lot. I will endeavor to do it less. The "only" comparison I can make is that of a foster child living with a family who claims to love him, yet every week he hears from them how "only" their biological children really belong to the family. Think of how that must hurt. That is my analogy and it is mine alone. It makes me feel worse, when my LDS friends say they love me in one breath and then that I am so much "less than" in the next. There are times I react well to that and other times I don't handle it so well. When someone testifies to how wonderful it is that they belong to the only true church, and that every other church is composed of the works of man or of the devil, and I know what III Nephi 27:11 has to say about the consequences of that - being cast into the fire, I want to get up and leave. I never have. Maybe I should. I have left this forum for months at a time for the same reason. Yet, I keep coming back with my questions. Don't ask me why, because I do not fully understand it. It is correct that what "faithful Saints believe is all over the map." That confuses me. One tells me one thing and someone else tells me something else. Occasionally they even whisper in my ear, after looking around "I don't really believe that:" their eyes revealing a concern for being heard. So yes, I get confused when folks say to me that things like apologetics, polemics, and epistemology are neither used nor important to members of the Church of Jesus Christ of Latter-day Saints. It confuses me as I read about organizations like the Correlation and Curriculum Committees whose work, it seems to me is to keep things aligned to the teachings of the Church. I don't understand the contradiction between what I am told here and what I read and am told elsewhere. So yes, I am often confused. I keep coming back to try and understand. I may someday stop; and some will breathe a sigh of relief; and then sigh because there is one less target to mock. I will simply sigh and walk away from trying to understand. I honor the members of the Church of Jesus Christ of Latter-day Saints. That is my truth. Some here don't seem to be able to handle the truth. So do you think this is the one true church because all the others are stale in comparison, and stay as is? I'm asking respectfully, and thinking that if this is the case I can certainly get behind that. Well it is a bit more complicated, but essentially YES! That is why I think history matters no more for the church than the crazy things you did at age 15 matter to the mature adult you are today. We may have had a wild past but look at where we are today. Speaking of polemics, how to account for the Catholic Church condemning the Covington boys based on short snippet of viral video? When it turns out that the boys were in actuality showing great self restraint and civility? Two of the most important values in contemporary US culture are values signaling and bias confirmation. Certainly the Catholic Church did not respond quickly and wrongly, it now seems because of bias confirmation. I would assume it had to do with values signaling. It would be a fun discussion sometime to chat about values signaling and bias confirmation as they relate to inter-faith Christian discourse, but that would a subject for another day! Or virtue signaling. A Parkland student objected to attempts to demonize the Covington boys. It is ironic that we are all united in expressing concern for the Parkland students but we are divided with some agitating for violence against the Covington boys. So sad. You are right . . . I meant virtue signaling. Sorry. Maybe it is values signaling too; I think I just made up a new term! Ha! I spent years as a deputy superintendent and superintendent of schools so I have a heart for all students. I would love to hear the views of the folks on this forum regarding the differences between apologetics and polemics. Depending on their exclusivity, Christian fundamentalists have often seen the debates between members of the Church of Jesus Christ of Latter-day Saints and "Christians" as apologetics, while many evangelicals would define them as polemics since more evangelicals than fundamentalists see Mormons as fellow-Christians with disagreements on non-essentials. In addition, polemics have traditionally be seen as more aggressive, hostile, mean-spirited etc. Perhaps as is often thought that inter-familiar strife might be among the worst kind. Apologetics are often seen as a more scholarly approach to disagreement. I mostly agree with that. I also think that the time of polemics is disappearing, although it's still there. That's largely because the main threat to Evangelicals (and conservative Christianity in general) is the rise of the Nones. Things have shifted rapidly over the past 25 years and especially the last 10. By and large even Mormon apologists tend to ignore Christian critics for the most part these days. (Robert Boylan is about the only person I see engaging in it much anymore) I think that trend started in the 90's with the FARMS/Signature wars but I also think Romney's nomination was a watershed as well. I am an evangelical who happens to believe that we (both LDS and non-LDS Christians) should stop all together from trying to convert each other since we are both Christians and that if and when we find disagreement, we should defer the debate unless the differences are about essentials. And I think 90% of held doctrines are non-essential. I don't expect many to agree with me on that in either community, and guess what, they don't! I am a student of religion and conflict. While I'm sympathetic to this, I suspect you'll find most Mormons find that a bridge too far simply because of what we see as essential ordinances and essential authority. I tend to agree most doctrines and interpretations of scripture ultimately don't matter too much. But the core of the gospel that Mormons see tied to the atonement includes some fundamental differences in practice and belief that I don't think we should say aren't essential. What say ye all? Is there a differentiation within the Church between those who seek to maintain purity within and those who seek to fight it from without? What are the commonly held definitions of the two means of advocating for doctrinal purity in your experience? Thanks so much. I think polemics is ultimately counterproductive. I also find it ethically dubious. To the degree it does anything it might strengthen in-group ties of those who pay attention to it. However I think it also has so many negatives that it likely pushes away more than it keeps in. I wish we could get rid of it entirely. With apologetics there's good stuff then a lot of bad stuff. It's got a bad reputation among some, although I think much of that is unfair due to tarring the whole on the basis of a minority of bad works (which often drop into polemics). However I also think there's only so much apologetics can do. Ultimately it's useless if there's not a direct encounter with the divine. Only God can convert. I suspect moderators won't like that tangent, but I'd just note it wasn't he Catholic Church that weighed in but a few local leaders. So far as I know the Pope has remained silent and may not even know about the issue. As for those (including the head of the school) who weighed in, it was because the framing of the editing video was so disturbing. We can blame them for reacting too soon, although our media environment makes it difficult not to. People now demand such instant response that a process of time is usually seen as avoiding responsibility. It's a sad time in media and news precisely because people want instant judgment and instant outrage. Societal wide that's not gong to end well. But I'd not blame the Catholic Church. Thanks so very much for your reply. It is wonderfully helpful. I really appreciate your recognition of "formal Evangelicals." The term "evangelical" is loosely thrown around to mean virtually anything and nothing, when in reality it refers to a very specific group of folks within Christianity with very specific theological, societal, and philosophical priorities. I also realize and accept that my hope for a diminution of the need to convert is a pipe-dream. Neither the faithful LDS Christian, nor the enthusiastic fundamentalist will go for that. Many Christians are lessening the polemic nature of discourse, which is a good thing. There are grassroots folks however in every tradition who simply want to win, dominate, etc. Certainly, someone like me can and should never posit was is and is not essential for someone else. Of course I can only speak for myself. I hope to do that in a better way than I have done here. Your final four words are very powerful - "Only God can convert." Sometimes I think Christians from all branches of the Gospel, try too hard to help Him make it happen. Thanks for your thoughtfulness. I also realize and accept that my hope for a diminution of the need to convert is a pipe-dream. Neither the faithful LDS Christian, nor the enthusiastic fundamentalist will go for that. Many Christians are lessening the polemic nature of discourse, which is a good thing. I think we can build on common grounds and fellowship with each other. I think Pres. Hinkley definitely was trying to do that during his time as President. I think he had a lot of success as well. I also think that while not all conservative Christians accepted Romney, in a certain sense his running for President and gaining a lot of conservative Christian support really helped as well. While I don't think what you want really should be done, I definitely see ourselves in a much better place today than when I was young. More "fundamentalist" conservative groups still see Mormons as a threat of course. But hopefully the rapid place of secularism has made it so they don't see us a problem #1 anymore. I definitely think reducing polemics is helpful. There were unfortunately in mid-20th century Mormonism often unfair conceptions of Catholicism as well - typically born out of a lot of ignorance along with received Protestant distrust. Of course when I lived in Louisiana the conservative more fundamentalist oriented Protestants were far more anti-Catholic than anything I saw the most polemical Mormon doing. The often self-designated evangelicals and Catholic war was something to behold. At least as pronounced as the worst "Godmakers" like anti-Mormon polemic. Not living there anymore I don't know if that's still an issue there. but I'd just note it wasn't he Catholic Church that weighed in but a few local leaders. "On the day of the incident, the Diocese of Covington and Covington Catholic High School issued a joint statement saying, "We condemn the actions of the Covington Catholic High School students towards Nathan Phillips specifically, and Native Americans in general....We extend our deepest apologies to Mr. Phillips. This behavior is opposed to the Church's teachings on the dignity and respect for the human person." They promised to "take appropriate action, up to and including expulsion." 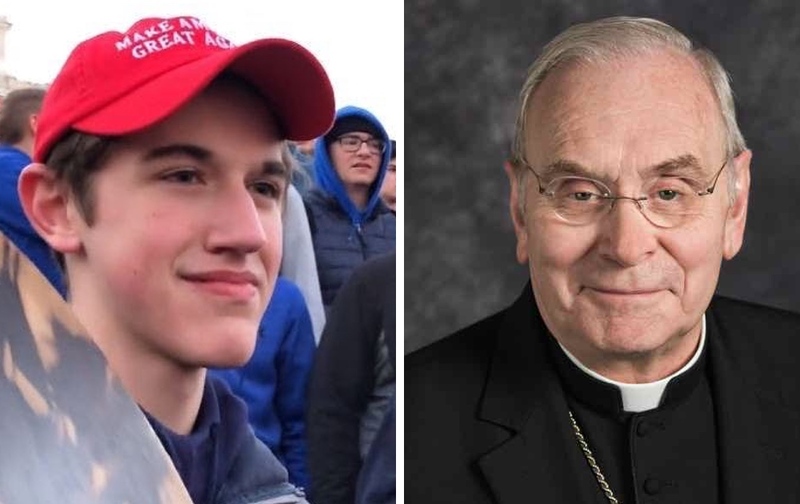 "Bishop Roger Joseph Foys of Covington, Kentucky, along with the Covington Catholic High School administration succumbed to the mainstream media's leftist spin of the Friday, January 19 altercation, issuing a joint statement of condemnation. “We condemn the actions of the Covington Catholic High School students towards Nathan Phillips specifically, and Native Americans in general, Jan. 18, after the March for Life, in Washington, D.C.,” the January 19 statement read." Another big blunder by the Catholic hierarchy. They jumped to conclusions without knowing the facts just like the mainstream media did. Their revised statement should, at least, have been the first statement, instead of threatening the boys with expulsion. Another example of where the Church ranks are so quick to throw children under the bus, while they continue to close ranks and protect the SHAMEFUL coverup they’ve all engaged in over the years!!! ETA: the LDS analogy would be someone saying "The LDS church said XYZ" when it turns out that one stake president said that. I fully agree. I must say that the Covington boys have shown tremendous respect and positiveness. Unfortunately the local leaders did not take the time to review the situation or to interview all that participated in the field trip. What are your thoughts about the players in the story? The Covington boys were morons just like everyone else involved. Casting them as heroes is as ridiculous as the original scandalous take. The rush to judgement was unfortunate, absolutely. I do agree with Nehor, though, the boys were being morons, as teenagers are apt to be, and are not heroes because they didn't do anything heroic. I think a heavy amount of fault lies with the chaperones, who should have immediately removed the boys from the situation with the Black Hebrew Israelites before anything escalated. It is telling of their worldview that the boy's mother initially described them as "black Muslims." Hey MN...Its been 24 hours and there has been a further development in the Covington case. I have to disagree with the characterization of the boys as "being morons, as teenagers are apt to be." Now comes news of the lawyers for the Covington students filing the first suit against the Washington Post for conducting an outright smear campaign against the boys. There are about a hundred other news organizations and various activist Hollywood celebrities who are on the list to be sued for acts of character assassination. Surprisingly (and maybe no wonder) the local dioceses in Covington are also being called to account. The boys should not have been demonized for choosing to participate in Pro-Life events at D.C. They have their First Amendment Rights to be anywhere in that town and to be able to honor their Catholicism and to be free to wear their MAGA hats. They were at the Lincoln Memorial only by prior arrangement for boarding their buses for the trip back to Kentucky. They had no idea that the Black Hebrew Israelites or native American activists would be there to denigrate them. I will say it again: the Covington Boys have been very exemplary in their conduct and tried their best to display positiveness. I think of myself as a "Restored Christian"
Ah hah!. There you have it! You are not a Mormon. You are a Restored Christian! I like it. I couldn't agree more with everything you have said. I was just trying to understand your comment "I think attempts at ecumenism are flawed from the start." I think of ecumenism as Christians coming together to acknowledge they are a community, implying they have great commonality, while acknowledging unique differences in polity and non-essential doctrines, such as Mennonite beliefs in conscientious objection and pacifism or Mormon beliefs in pre-mortal spirit children, three levels of heaven, etc. I believe all those beliefs to be non-essential and that each Christian group can maintain those doctrinal distinctions which often come out of a unique interpretation of Scripture and or other revelation via a shared history and community norms, while joining together in a shared community of belief as Christians. I struggle to understand where my LDS friends are in all of that. I am really trying. . . but am not yet there. I think most Christians view salvation as a one step process, and that everyone is the same in heaven. They just don't see the many rooms in the house of the Father, Yeshua taught about. How can one be least in the kingdom of heaven if it is the same for everyone? (I realize the JST reads differently) The scriptures just don't teach that. Instead we each shall receive reward after salvation according to our works. Since this is a major aspect of our eternal life, isn't it important to teach it? I believe it is essential. To fail to teach it is doing our brothers and sisters in Christ a grave disservice. How would we defend ourselves to Him, when He asks why did you not teach the fullness of my gospel, so that your brothers and sisters did not know they could be exalted with me?